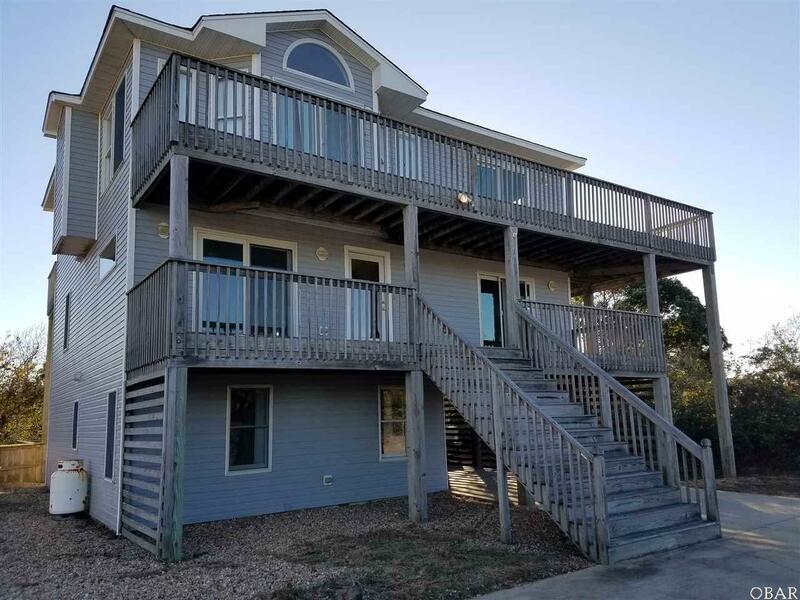 1309 Duck Road, Duck, NC.| MLS# 102623 | Outer Banks Homes For Sale, North Carolina Home Search Including Nags Head, Pirates Cove, Manteo, Kill Devil Hills Kitty Hawk, Southern Shores, Duck, and Corolla North Carolina, Oceanfront and Soundfront properties for sale and long term rentals. Lots of potential with this great Duck property. This reverse floor plan home offers 6 bedrooms with 4 of them being masters with their own private baths and 3 of them offering deck access and sound views. There are 2 other bedrooms that share a jack and jill bath. The ground level features a game room area with wetbar, half bath, pool access and a master bedroom with a private bath. Middle level has 4 bedrooms; 2 masters with private baths and the other two rooms with the jack and jill bath. The top level has a large great room with sound views and deck access, kitchen, dining area, sunroom for additional living area, half bath and the final master bedroom with private bath, deck access and sound views. Private pool just had all new pool equipment installed. You have a clean slate with this property to paint and furnish in your own style. Selling Office: Outer Banks Blue Realty Srvcs.